Jeremy’s point is that visualizations should help us explore and gain insights into data. To those familiar with the Bay Area geography, this image is a useful, elegant reminder of what we know to be interesting places, but there is little true insight in it. The visualization doesn’t tell us anything that we don’t already intuitively know. Visitors to the area, on the other hand, might use such an image in an interactive way to help them plan their itinerary, to explore, to learn about the place. There are nice parallels here between exploratory search and recommendation systems: recommendation systems (such as the image in question) show where others have been (here, literally) to help others find their way later. Exploratory search systems, on the other hand, are intended to help people map out previously-unexplored areas. These are uncharted, or at least under-charted, areas in which few have yet ventured. The Choose Your Own Adventure piece by Christian Swinehart that I described last November is an elegant example of exploratory visualization. He built some interesting diagrams to display various narrative structures in a set of hypertext fiction books. The visualizations are designed to reveal structure that is not necessarily visible otherwise, and the elegant presentation and bold graphical design make interacting with them a pleasure. The upshot is that visualizations can support both entertainment and exploration, and that the two aren’t always separable. But we should be clear about the intent of the visualization and try to design visualizations with enough depth to be useful not just as pretty pictures, but also as vehicles for generating the appropriate type of insight. Jeremy Pickens contributed to the writing of this post. Hi, and thanks for the interest in the map! I agree with you that nothing in it is probably very novel to someone who already knows the area well. But I take that to be validation, not criticism — if, for example, it showed lots of activity on a mountaintop that you know to be inaccessible, that would be evidence that something is wrong with the data. What I do think is valuable about a map that tells you what you already know is that identifies edges of regions more precisely than you could probably remember off the top of your head if you were trying to draw your own map of the most interesting places. You may not remember exactly which blocks of a particular street are the interesting ones, but the map does, and if you are involved in that area, it may allow you to learn why people are turning back at a particular point, and what the successful parts are doing that could be applied to the less successful parts. Thanks for your comment! 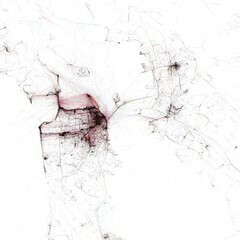 I agree that a map can act as a memory aid for familiar territory. I think Jeremy was looking for exploring new terrain (metaphorically, I assume!) that hasn’t been explored by others.